Sony is to make its top 500 films available digitally in the next year. Michael Arrieta, senior vice president of Sony Pictures, said at a US Digital Hollywood conference that it wanted to create an "iTunes" for films. Films will be put onto flash memory for mobiles over the next year, said Mr Arrieta, and it will develop its digital download services for films. Movie studios are keen to stop illegal file-sharing on peer-to-peer nets and cash in on digital the download market. 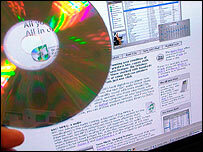 Movie piracy cost the industry £3.7bn ($7bn) in 2003, according to analysts. The movie industry body, the MPAA (Motion Picture Association of America) has started a campaign of legal action against operators of BitTorrent, eDonkey and DirectConnect peer-to-peer networks. "We want to set business models, pricing models, distribution models like (Apple chief Steve) Jobs did for music, but for the film industry," Mr Arrieta told Cnet news. Sony and other movie studios, say Cnet news, are keen to wrestle power, and financial gain, from any single technology giant - like Apple - which has had success with iTunes for music downloads. There are legal film sites now, such as Movielink, which provides access to a limited catalogue of legal films. It is a partnership between Metro-Goldwyn-Mayer Studios, Paramount Pictures, Sony Pictures Entertainment, Universal Studios and Warner Bros. There remain big issues to giving people more access to films and other digital content anywhere, anytime. Issues over protecting and controlling the distribution of content once it has been legally downloaded and moved to a portable device, for instance, still concern the movie industry. But with the growing popularity of powerful portable entertainment devices, such as Sony's PlayStation Portable (PSP), which can play movies and other multimedia content, it is becoming a pressing concern for the industry. The PSP went on sale in the US on 24 March and the first million came with Spider-Man 2. But films for the device are available in Sony's own format, called UMD, which are physical discs. Lions Gate Entertainment and Disney have announced forthcoming film titles that will be made available on the format. The Digital Hollywood conference in the US runs from 29 March to 1 April.